When you drive north on Highway 101, just past the small town of Orick, you will begin to marvel at the giant redwoods of Redwood National and State Parks. There is no sign letting you know you have arrived; you just slowly become shaded by the great canopies towering above you. A National Monument for the Santa Cruz Coast? On the Santa Cruz coast, surrounding the picturesque town of Davenport, is a sweeping expanse of native coastal prairie and redwood forest. This beautiful landscape is special not only for what it is, a local historical and ecological treasure, but for what it could become — our next national monument. Over the weekend, the League celebrated the centennial anniversary of the National Park Service at our Orick Mill Site property near Redwood National and State Parks. It was a momentous event, and I was honored to speak to the attendees about the significance of the moment. For those who weren’t able to be there, I’ll take the opportunity to share my remarks, and some photos, here. Reading the perspective of someone who has never seen a redwood forest, I got to vicariously experience the redwoods for the first time again. I wanted to share “Close Encounters with Coastal Giants” with you, so that you can enjoy it, too. After college earning bachelor’s and master’s degrees in Earth sciences at Stanford University, Justin Faggioli spent three years working as a geologist, primarily on projects in Alaska. His job took him to some of the most remote areas of the state, most of the time in a helicopter. In addition to the geologic work, Justin was able to enjoy the beautiful flora, amazing fauna and spectacular scenery. When redwoods enthusiast John Montague first volunteered at Save the Redwoods League, he began by assisting with chores at the office. He’s so dedicated to the forest that soon after he volunteered out in the field, mapping, taking measurements, and identifying notable trees under the League’s direction. Dendrochronologist Allyson Carroll has decoded centuries of history hidden in giant sequoias and coast redwoods, thanks to the League’s research grants program and our members’ support. For botanist and plant ecologist Peter Comanor, the redwood forest is about receiving and giving. 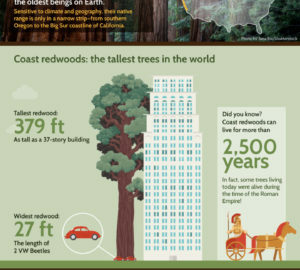 He first saw a redwood tree in an exhibit at the American Museum of Natural History in New York. It was, he recalled, an interesting and informative display, but it didn’t prepare him for his first visit to the redwood forest. Peter B. Frazier, Save the Redwoods League Board of Directors Treasurer, comes from entrepreneurial pioneer stock. When his great grandfather was only 19 years old, he headed from Boston Harbor around Cape Horn to the then-tiny town of San Francisco. Like thousands of people from around the world, he made the long journey to look for gold.